Regional American fare and an extensive boutique wine list on Washington Avenue’s restaurant row. About the restaurant: Hardly a dive, this eatery on the trendy Washington Avenue restaurant row offers Texas cuisine kicked up a notch. Eclectic art and cheeky phrases like “No Working During Drinking Hours” adorn the funky space. There is also an outdoor patio out front. Food & Drinks: The menu kicks off with crispy deviled eggs, fried pickles and sticky pork ribs, plus several salads for more healthful choices. 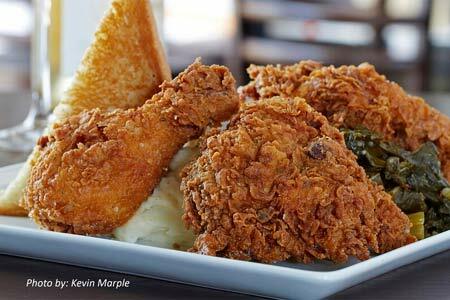 Local ingredients are used in comfort food like the jalapeño and buttermilk marinade for the deep-fried chicken (which really does pair well with Champagne, just like the T-shirt slogan says). There's also a gluten-free version of the fried chicken. Desserts change often but expect to find options like bread pudding. Other mains might range from Southern-style meatloaf to curried veggies and noodles to Gulf shrimp and creamy orzo. The food is so good that other chefs hang out here late at night. Both the menu and the extensive boutique wine list change seasonally. Also located at 214 Fairview St. #2, Houston, 713-528-9200.